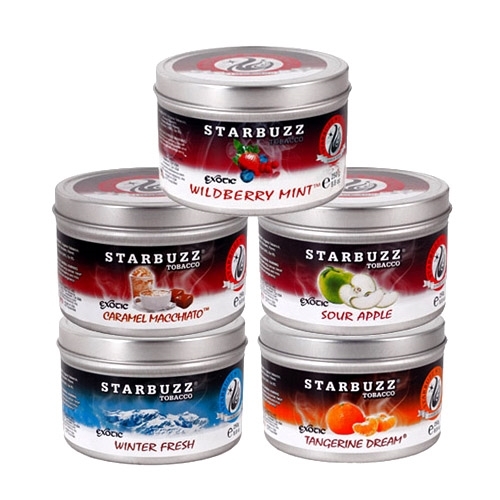 Starbuzz Shisha created a home run of a flavor in 2005 with the release of their Blue Mist flavor and over time they continued to create a huge name for themselves. You've probably had a Starbuzz flavor at a lounge or from your local smoke shop, and if you've never experienced their blends this will be a whole new world of flavor options. They've created over 70 flavors within this collection and they all arrive in a metal tin that features a genuine Starbuzz stamp for quality assurance. We highly recommend this brand to any new hookah smokers as this tobacco is easy to prepare and features a lower nicotine content for a smaller buzz. The golden leaf tobacco creates a sweet flavor profile and Starbuzz adds a little juice to get those clouds rocking early.